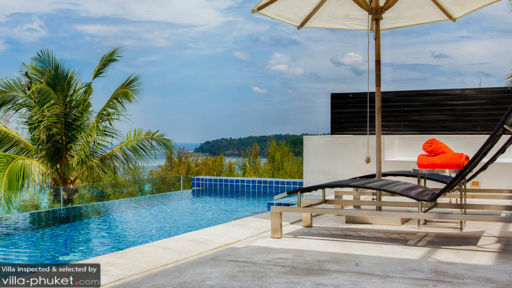 Located near Surin beach in Phuket, Villa Napalai is a contemporary private villa overlooking the ocean, with a beautiful landscape including lush tropical vegetation. With verdant gardens and a convivial beach vibe, it is an ideal tropical holiday destination to be enjoyed with family or friends. The four-bedroom private home is great for relaxation with its infinity-edge swimming pool, excellent services like a gym, games room, spa, and luxurious living spaces! The villa is home to four, well-appointed and furnished bedrooms of which the master bedroom is located on the upper floor with the best view of the island. It is furnished with a king-sized bed and offers a spacious layout in which to relax and call it home for the next few days. The en-suite bathroom is equipped with a Jacuzzi for the most luxurious and tranquil baths. The other three bedrooms are found on the main floor and feature queen-sized beds and double bed. There are comfortable armchairs as well in the bedrooms and each has an en-suite bathroom with necessary facilities. The bedrooms are all air-conditioned to keep the rooms comfortably cool. With carefully planned outdoors, the villa provides guests with a private haven in which to relax, forget all your worries, and simple take in the beautiful surroundings! There is a lavish swimming pool set amidst even lavish nature with vibrant flowers, towering trees, and dense foliage. As you lounge in the pool, gazing at the ocean and the neighboring areas, you will feel all the more relaxed and rejuvenated, ready to head out and explore the island! There are several sun chairs on the pool deck, ideal for sunbathing but don’t forget your sunscreen! The villa provides an enchanting outdoor dining space to guests in the back, with even BBQ facilities so that guests can relish a hearty, freshly-prepared meal with loved ones in the open air, under the starry-night sky! 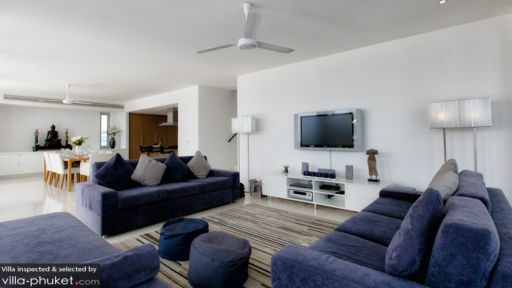 Villa Napalai has many spaces for recreation and relaxation including the modern living area with white interiors, with crisp and elegant furnishings. This room looks out at the panoramic vista of Surin beach, and is great for hanging out with everyone at the end of the day. There is an entertainment room with plush couches, massive flat-screen TV and a pool table for enjoyment. A multi-purpose gym equipped with great machines and everything you could need for a workout is also accessible! What’s more, a spa room with massage tables is the perfect touch to a tropical villa, for impromptu Thai massages right at home! The dining area is located right beside the sitting area, overlooking the pool and the glorious views. The well-lit and vibrant living area is where you will end up spending most of the time after the pool area! There is a fully-equipped kitchen with modern facilities and equipment for your use as well. There is a friendly and kind staff to look after the needs and requirements of guests at Villa Napalai. If desired, they can serve freshly-prepared meals all day at an added cost. The staff can arrange for in-house massages and even manage any excursions or trips you might wish to take. 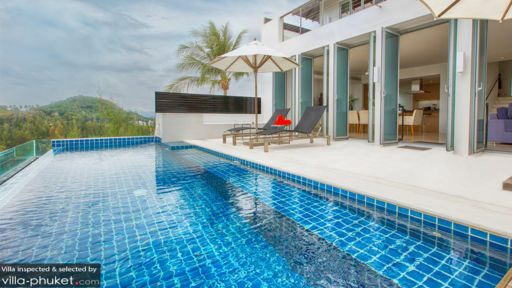 The villa is located close to the Surin beach which is a nice, laidback stretch with shallow waters. There are many beach clubs and restaurants in the vicinity including Catch beach club, Benny’s American Bar & Grill, and several others for you to try out!